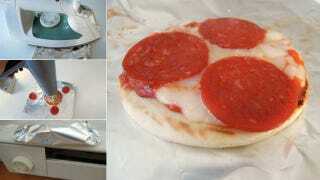 Pizza blog Slice was curious to see if childhood favorite Lunchables Pizza, could be hacked into something more magnificent and um, more pizza-like so they heated up the cracker, cheese and sauce concoction with an iron, blow dryer and a heater. Which is best? According to Slice, the iron does well at melting cheese and keeping the crust moist but there's too much cheese loss in the process. Blow drying offers a lot of control on cheese meltage but is tiring and while using a heater creates the most uniformly delicious Lunchables pizza, it isn't exactly desirable in certain months of the year. So is there no hackable solution? Of course not!